Single-stage horizontal centrifugal pumps conforming to DIN 24255/EN 733 standards. Horizontal centrifugal single stage pumps. They can be coupled with both electric motors with 6 and 4 poles and with diesel engines. Monobloc centrifugal electric pumps with horizontal shaft, single stage with adjustable packing or mechanical seal. 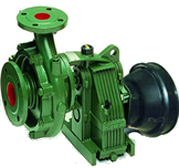 Horizontal centrifugal multistage pumps. They can be coupled to both engines and electric motors with 2 and 4 poles. Horizontal centrifugal multistage pumps suitable to be flanged to diesel engines. Suitable for pumping water in mobile or semi-fixed irrigation systems.